Jerry buys an expensive suede jacket with a pink and white striped lining. He wears it to a dinner date with Elaine’s intimidating father. It’s a shame that, in the words of Jason Alexander, Lawrence Tierney was a “total nut job”, as his disposition put paid to any future appearances of Elaine’s father. His portrayal of Alton Benes is palpably menacing and, because he plays it dead straight, he ensures the laughs elicited from George and Jerry’s terrified predicament are even greater. Not that it sounds as if Tierney could have played it for laughs if he’d wanted to. A renowned bruiser, he was known for his confrontational attitude; he caused young Quentin Tarantino problems on the set of the following year’s Reservoir Dogs. On Seinfeld he reportedly stole a butcher’s knife from the kitchen set, but returned it after Jerry (inadvisably perhaps) confronted him over he was concealing upon his person. 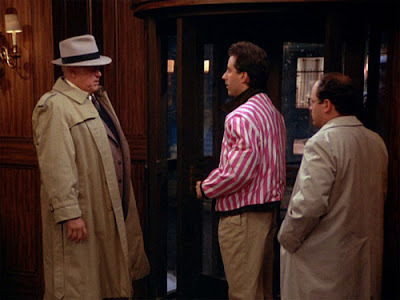 This episode may be more linear than the previous two (you couldn’t really call the jacket a separate plot strand since Jerry is a constant in both), but structurally it’s very satisfying and the resolution is perfectly formed (gruff Alton refuses to be seen with Jerry wearing his jacket stripy lining out, so the suede is ruined in a snow shower). This is very much Jerry and George’s show, though. Elaine gets a great entrance, showing off her physical dexterity as she recounts Kramer’s offer of a lift (and stealing away Jerry’s urge to recount the traumas theyhave suffered), but she barely says a word to her father. Kramer, always on the look out for something for nothing, ends up with both Jerry’s old leather jacketand his ruined suede one (“I’m going to do something about this lining”). We’re also treated to an early classic coda, as Alton drives home and finds himself involuntarily singing “Master of the House” (as George notes earlier, “It just comes out. I have no control over it”). Jerry: Frankly, I prefer the company of nitwits. Elaine: So that’s why we’re not together any more. Kramer: That’s more you than you’ve ever been. George: What am I, Bud Abbot? What did you call me idiot for? Alton Benes: I don’t need anybody to tell me it’s going to rain. Alton Benes: We had a funny guy with us in Korea. A tail gunner. They blew his brains out all over the Pacific. There’s nothing funny about that.